The Hollywood Ten, a group of successful screenwriters accused of subversive activities while members of the Communist Party, were the original sacrificial lambs offered up by Congress’ House of Un-American Activities Committee in the early Fifties. This story, widely known by people my age and older, but rarely fictionalized, could have easily been made in to a nostalgia piece, with very little heart and tons of caricature. But while Jay Roach’s “Trumbo” starts out as a paint-by-numbers history lesson, it very slyly becomes something much more important and satisfying…a worthy companion to (but still bested by) the greatest film ever made about this frightening time in our country’s history; Martin Ritt’s “The Front”. John McNamara’s script is taut, engaging, heartbreaking and hilarious – delicately focusing on the man, Dalton Trumbo, while never losing sight of the contextual goings-on. As mentioned, the first act spends perhaps a few scenes too many on background, but all is forgiven with an incredibly dense, complex, and subversive second act. And it concludes beautifully with understatement and reality, instead of gloss and melodrama. 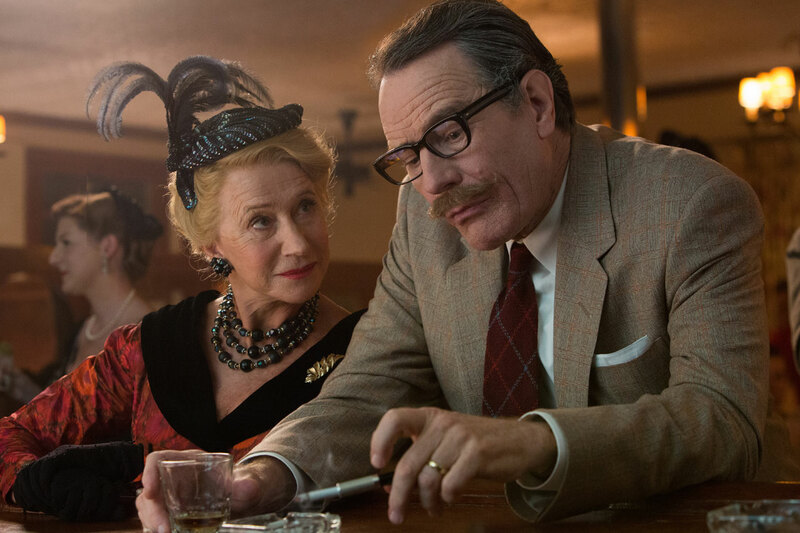 Bryan Cranston is, as you would imagine, phenomenal as Trumbo. He’s charming, obnoxious, ironic, crestfallen…sometimes within the same scene. But he is, by no means, alone in displaying exceptional craft-work. Helen Mirren is the perfect foil – vicious yet cool. Diane Lane and Elle Fanning are more than adequate in underdeveloped familial roles. And John Goodman is note-perfect. But for me, what makes the film become something more than a bio-historic pic, are the performances of Louis C.K. and Michael Stuhlbarg. Louis C.K., tasked with being the sympathetic heartbeat of all blacklisted victims, is so well cast…he is incapable of being anything but real. And Stuhlbarg, as ALWAYS, is simply a wonder. Credit must go to Casting Director David Rubin…as well as Roach, for not trying to find movie star look-alikes, but instead finding wonderful actors who’s performances infer, rather than mimic. Matthew Shapiro’s score, my favorite of the year thus far, is understated and beautiful. In its calmer sections, reminiscent of Bernard Herrmann’s “Taxi Driver” score, while perfectly embodying Cranston’s irreverence in other areas. I have listened to the entire score three times in the last 24 hours. Just lovely. “Trumbo” is not a perfect film, but as a window in to the fear-mongering, and demagoguery of that time period – and as a warning sign for our own modern times – it’s pretty damned close. Oh…if you do see it, which you should, make sure you see “The Front,” as well (trailer below following this film’s trailer). The subject matter has plenty of room for two excellent films.